Perchaplectic is a one of a kind collection of songs & recordings reflecting this artist’s range of musical interests. Presented in an album format, the CD is 74 minutes long. All of the material was recorded & mixed by Galasso in his home studio and the musicians playing on the CD are all exceptional. Many of them were child prodigies, and all of them are from Baton Rouge, Louisiana. 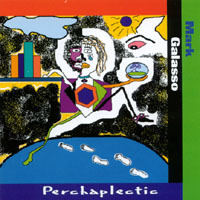 In 1999, Galasso singed on with Labrador Records in England where Perchaplectic was the featured CD on Audiostreet.com who called the CD, “a stunning eclectic collection of 17 songs”. In 2001 his song “Let’s Make it Work Somehow” charted at #14 on the garageband.com “Pop” charts and was featured as “Song of the Day” based on enthusiastic reviews by listeners from all over the world. Two songs off of Perchaplectic, the Bowie-ish “Blonde & Fair”, and his Epic “10 Miles Away” have been licensed by Shockwave.com for use in their Photojam application.